Hearts beating in my front garden ~ June 2009. It also has a fantastic shape and colour! nice one Terra. As the buds open, they gradually change from pretty dark pinky apricot to lovely lighter shades. Are they a Floribunda Rose? Almost looks like abig version of my new miniature...it's absolutely beautiful, TT! Wow Fabulous rose...and aptly named ! Gorgeous colouring, TT, and such a lot of lovely blooms. amazing color on so many blooms! That is so beautiful TT, I love the colour. ~lovely colour~glad it has a beautiful scent too! Lol. Yes, it is lots of lovely colours. Seems to do well in my garden. I'm trying to make cuttings from it. Don't know if it will work. The only problem is....space for it, Tt!! lol. I shall just have to admire yours. This is lovely TT, wonderful colour. It's great when they have a lovely scent. This is one for my wish list TT. .... does more than it says on the label... Lol. They are gorgeus, I love the colour! Wow, these are stunning!! I love the color. I love the different shades of pinks and peaches in them. My new one finally bloomed and I took one picture of the first bloom and was going to take progressive pictures to show the color changes, alas a deer came by and zeroed in on the rose bush and nipped all the buds off. Thanks for adding this pics. to your favourites. I wish I could send you the wonderful scent to put on your favourites too. Lol. Wow they are beautiful TT, I wish I could have them growing in my garden!! That's a beauty TT and already on my shopping list as I'm sure it is for many seeing your photo. I just love the warmth of the colours of this plant. Excellent!! Yes, this is a good rose. Doesn't get much rust on the leaves, and has such gentle variation of petal colour as the buds open.... together with a wonderful scent..
.... and when you go plant shopping I bet you have a VERY long list... Lol. Absolutely gorgeous form and color on these blossoms TT. You really have a winner here ! This is a super rose isn't it ! This Heartbeat rose plant has a whole new array of flowers just starting to bloom ! So nice to have colours like these and scents too - lovely! beautiful rose and same colour as four I planted in our front garden which are Lady Hamilton and also have a delicious strong scent. When they have established more, I will take some photos. Just found this beautiful rose, just love the colour too. Is he on GoY, please ? I'll need to remember the name incase I ever see it. I'm trying to grow cuttings... not sure if I'm having any success ..Lol. Gorgeous! I am also enjoying seeing the background of this picture. Looks like you have climbing roses on the fence.....? Hope you take close-ups of this.. I will look forward to seeing the photos. Thank you, Terratoonie. Amazing color! It's on my "want" list for Spring for sure! 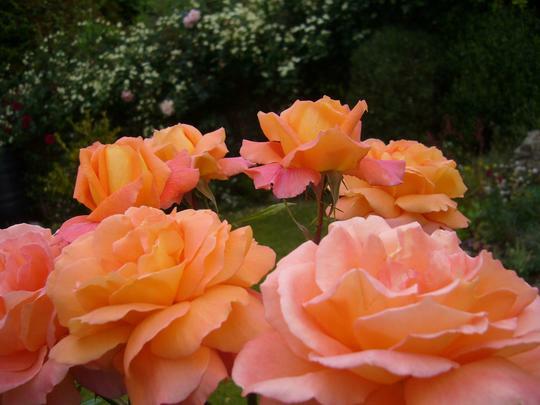 Would love for you to send it in to my web site http://www.allaboutrosegardening.com/Favorite-Rose.html and (show) everyone this rose, and tell what makes it so special!